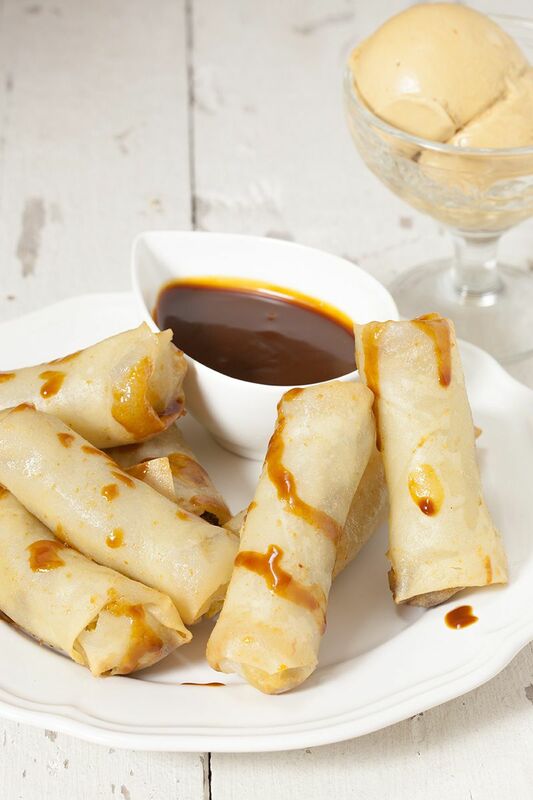 Sweet and savory deep-fried banana lumpia, it's as much fun to make as it is to eat! Who doesn't love mini bananas? Ready in about 25 minutes, recipe for four people. Heat sugar and water in a small saucepan on medium low heat. Do not whisk it at first, wait until the water has evaporated and the sugar starts to brown. Wait until the colour of the caramel is dark brown, but be careful, there’s a thin line between dark brown and lightly burned. The caramel will taste bitter when it’s burned. ADD cream and whisk for a smooth caramel sauce. PLACE a spring roll wrapper on your work surface, one side pointing upwards. PEEL the little bananas, it’s easy when you don’t peel it the normal way, but you start peeling at the bottom instead of the top. 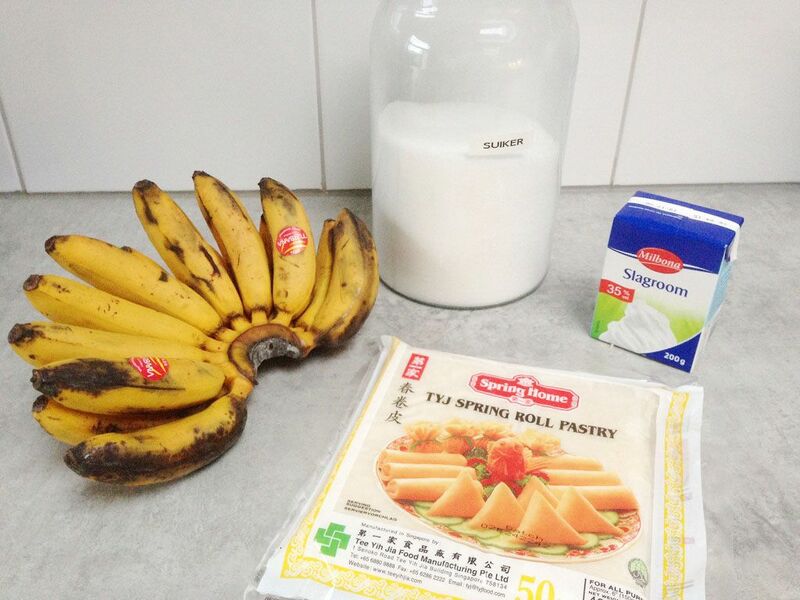 PLACE a banana on top of the spring roll wrapper, fold it inwards and use a little bit of water to stick it together. Repeat this step for the remaining bananas. HEAT your frying pan to 180 degrees celsius or 350 degrees fahrenheit. Fry the lumpia until they are golden brown, that will take about 3 to 4 minutes. Pay attention to not overcrowd your pan while frying these lumpia. 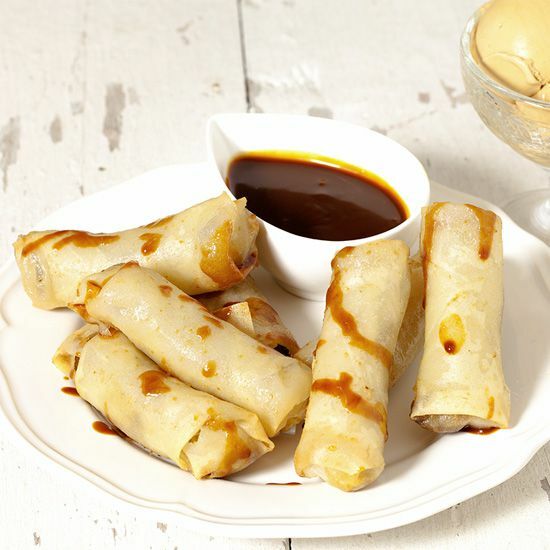 These lumpia are great as they are, but try serving them with some home-made caramel ice-cream. 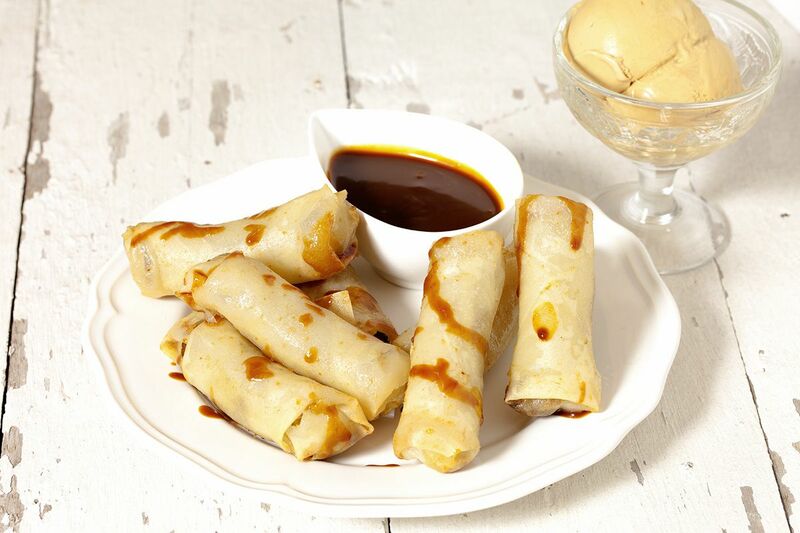 Imagine the hot and sweet lumpia with the cold, sweet and silky ice cream, to die for!